We’re excited to announce that Khan Academy has created lots of new math practice problems for the start of the school year! We now have 100,000 problems. We built out this content because we wanted to offer deeper, richer practice problems to help students rigorously master concepts. Nice! Who’s writing these math problems? We’ve brought on a team of 15 math teachers, tutors, and professors to write creative problems that promote deep conceptual understanding of a range of math topics. To ensure our content is high-quality and always improving, all questions are peer reviewed, and we continuously refine our math problems based on feedback from the millions of students and teachers who use our site. And for teachers getting ready for Common Core, we’re excited to let you know that we’re creating new math problems that comprehensively and rigorously cover the Common Core State Standards. We’ve already written new questions for many of the 4th-8th grade standards and will cover all of the Math Standards by Fall 2014. You can check out an up-to-date mapping of our practice problems to the Common Core here. Yep! Here are a few examples of the thousands of questions we’ve added in the past few months. It’s one thing to know what an even function is. It’s even cooler to understand what it means in a real-world physics, statistics, or finance problem. 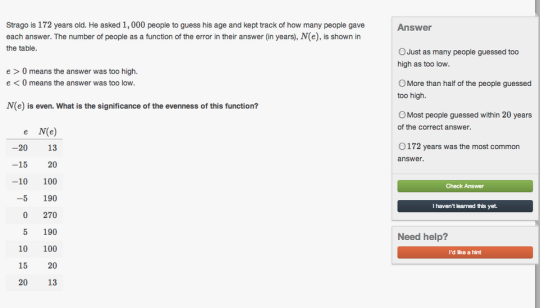 Try your hand at it in our interpreting features of functions exercise. In our units problems, students use proportions to solve real-world unit conversion problems. Sometimes it’s a matter of life or death, as it was for the squirrel in this problem. Let us know what you think! You can suggest ideas for new content or share updates to our Common Core mapping here.